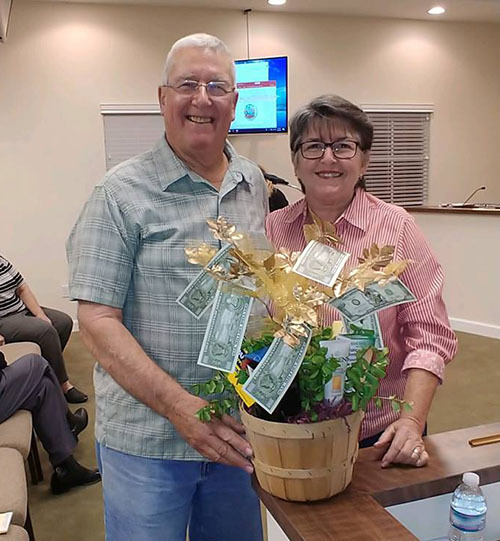 Former Mayor Dave and Sharyn Browning presented a money tree to the new Loxahatchee Groves Town Council at this week’s meeting as a token of good luck. The Loxahatchee Groves Town Council this week agreed to strip its web page of its documents and videos until the site can be made compliant with the Americans with Disabilities Act. However, at the Tuesday, April 2 meeting, the council allowed a two-week delay to give people who want any information time to retrieve it. Consultant Steven Murray with Municipal Technologies asked for direction based on a workshop that was held before the meeting, comparing costs and services of two web service providers that have been used by the town and the Loxahatchee Groves Water Control District, and whether to strip the web site until it can be made ADA-compliant, but the solutions are not cheap. At the workshop, Murray compared the costs of the two providers. Municode would charge $37,248 annually, and CivicPlus wants $36,128 for the first year, to redesign the web site, automate the agenda and compete ADA-compliance testing, which is the greater cost for both companies. Councilwoman Phillis Maniglia favored stripping the web site down to the bare necessities, making sure that town staff and officials’ e-mails and phone numbers are kept on. Town Manager Jamie Titcomb said that if the council chooses a provider, it should direct Murray to draw up a contract for approval at the council’s next meeting. “As far as the stripping and updating of the material on the web site, that could be done in-house with staff based on our current web site,” Titcomb said. Murray said he would also like to start ordering equipment for closed captioning at a cost of about $1,500. “That equipment is well below the town manager approval, so that way we can hit that for an eight-week process where we can actually turn on closed captioning and turn back on the videos for the council meetings,” he said, adding that he could wait until the next meeting after the council approves a contract to order the equipment. He added that the closed captioning will also require a live writer at a cost of about $15,000 a year for 12 hours of transcription a month. Maniglia made a motion to have Murray write up a contract with CivicPlus, strip the web site and order the equipment. During discussion of the motion, Councilwoman Lisa El-Ramey asked if the contractor was going to automate the agenda. Titcomb said at the workshop, they had discussed that automating the agenda puts less strain on staff. Titcomb noted that all components of the contract would come back to the council for final approval. Councilman Robert Shorr was critical of moving on the entire package right away. He added that the town is still in the midst of a staff transition, and that agenda automation will change the profile of the preparer from a clerk to an IT person. Murray and Titcomb agreed that the work could be phased, placing the most critical ADA items and stripping the web site before going to agenda automation, possibly budgeting that for the upcoming year. Maniglia said she wanted to move forward with the plan. Councilwoman Laura Danowski pointed out that 814 cases were filed against businesses and governments for ADA non-compliance, and 325 were in Florida. Town Attorney Michael Cirullo said dozens of local governments have been sued, mostly by a few individuals. Titcomb said one town he worked for took eight to 12 weeks to get its new site up and running, and over a year to get it to go live. Shorr added that he would like to get a third bid for the project in accordance with town purchasing rules and added that striving to be ADA-compliant goes a long way toward avoiding a lawsuit. Cirullo pointed out that most of the lawsuits are resolved before they actually go to court in the form of monetary compensation to the plaintiff. Maniglia said that no information would be lost by stripping the web site, which only reproduces information that is on record at town hall. The question was called, and it failed 3-2 with Danowski, El-Ramey and Shorr opposed. Maniglia modified her motion to wait two weeks before stripping the web site to give people the opportunity to retrieve any information they want to retain, and it carried 5-0.